UNICEF ambassador Robbie Williams enlisted the help of his celebrity pals to take part in this year’s Soccer Aid event, held at Old Trafford on 6 June 2010. The event was broadcast live on ITV1 on 6 June, with a post match review “Extra Time” on ITV4. Two star-studded squads of footballing legends and celebrities from England and the Rest of the World took on one another in an electrifying football match all in aid of UNICEF, the world’s leading children’s organisation. The brainchild of Robbie Williams and UNICEF UK, this year’s event was hosted by Dermot O’Leary, and the stars included actor and TV presenter Bradley Walsh, GMTV’s Ben Shephard, comic genius James Corden, world-famous chef Gordon Ramsay, presenter and DJ Jamie Theakston and actor Jonathan Wilkes. Comedian Patrick Kielty, boxing hero Ricky Hatton, Irish super group Westlife, actor Damien Lewis and cricketing legend Brian Lara alongside footballing heroes Alan Shearer, David Seaman, Tony Adams, Teddy Sheringham, Jamie Redknapp and Henrik Larsson were also on the pitch. Money raised through the profits from ticket sales and donations made by viewers during the match will go to UNICEF’s invaluable work helping children around the world. This was the third Soccer Aid event, with the previous matches, held at Old Trafford in 2006 (when Bradley was on the wining side beating the “Rest of the World Team” 2-1) and Wembley in 2008, raising almost £6 million in total for UNICEF’s work. UNICEF UK’s Director of Communications, Victoria Rae said, “Soccer Aid 2010 will raise crucial money for UNICEF to help children around the world. Every minute of every day, children die from common diseases like measles, diarrhoea and malaria. Millions of children don’t go to school, have food, shelter or clean water. 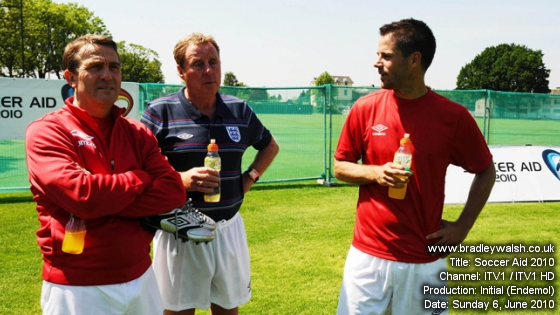 Watch the highlights from Soccer Aid 2006.